The Renaissance - harmony attained. Leonardo da Vinci in Milan: guided tours. The pride of the city-states. At the time Italy was, in fact, divided into small independent states in competition to outdo each other. The city-state rulers needed therefore to secure the services of the greatest masters to beautify their cities and create works of lasting fame. 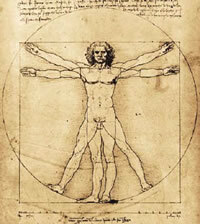 Artists turned to mathematics to study the laws of perspective and anatomy to study the human body. Thanks to this, the artist’s horizon widened: he was no longer just a craftsman but a master in his own right. Artists aimed therefore for great achievements that would compel the rest of society to accept them as men of unique and precious gifts. It was a struggle against society which granted social status to poets who worked with their brains but not to artists who worked with hands. As there were many centres competing for the services of the best masters of the time, the artists could then dictate their terms. It was the artist who granted a favour to the rich prince by accepting a commission rather than the prince bestowing his favours on the artist.